Speaker of the House Paul Ryan, R-Wis., strides to the House chamber at the Capitol in Washington, Friday, Dec. 18, 2015. “No matter what President Obama says, his word does not trump the Second Amendment,” the Wisconsin Republican said. Obama, his aim to keep weapons out of the hands of potential mass murderers, outlined his plans to prevent more killings in a half hour speech to the country. 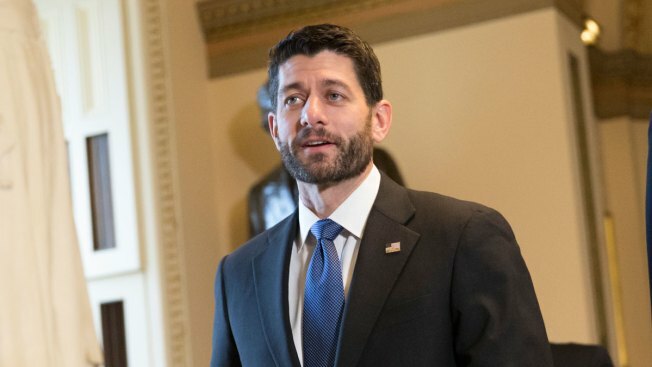 Ryan said Obama's efforts to expand background checks to cover more firearms would no doubt be challenged in the courts and would overturned if a Republican is elected president in November. He accused Obama of failing to respect the right to safe and legal gun ownership that the country has valued since its founding. “He knows full well that the law already says that people who make their living selling firearms must be licensed, regardless of venue,” Ryan said. “Still, rather than focus on criminals and terrorists, he goes after the most law-abiding of citizens." Reaction to Obama's actions fell largely along party lines. Texas Sen. Ted Cruz said that Obama's new actions to more tightly regulate gun sales were not worth the paper they were written on, the Associated Press reported. During a campaign stop in Onawa, Iowa, the Republican presidential candidate repeated his promise to repeal all of Obama's executive actions, including the latest ones on guns. Cruz said that "when you live by the pen, you die by the pen." And he added that his own pen "has an eraser on it." GOP front-runner Donald Trump vowed to "un-sign" the president's measures, the AP reported. Florida Sen. Marco Rubio said that on his first day in the Oval Office, "those orders are gone." Former Arkansas Gov. Mike Huckabee labeled Obama's actions "a blatant, belligerent abuse of power." Former Florida Gov. Jeb Bush, in a guest column in The Gazette in Cedar Rapids, Iowa, accused Obama of trying to do an end-run on the Second Amendment. “Obama’s declaration that he will impose his gun control agenda by executive order shows an utter disregard for the Second Amendment as well as the proper constitutional process for making laws in our nation,” he wrote. “In the wake of the President’s vow to ‘politicize’ shootings, it’s hard to see today’s announcement as being about more than politics,” the Kentucky Republican said. He said Congress would examine the latest actions closely to determine whether they followed federal law and the Constitution.
.@POTUS is right: We can protect the Second Amendment while protecting our families and communities from gun violence. And we have to. U.S. Sen. Bernie Sanders of Vermont said that he would continue Obama’s executive actions and accused Republicans of being more loyal to gun lobbyists than to Americans. “It’s become clear that no mass shooting, no matter how big or bloody, will inspire Republicans to put children and innocent Americans over the interests of the NRA,” Sanders said in a statement.